With the regular support of veteran professionals, we are affianced in presenting Project Cargo & Breakbulk Handling Services. Highly qualified and talented professionals compile these services in line with the particular details given by our valued clients. These services are offered in a best possible way as per the precise requirements of the diverse clients. Additionally, these services are widely admired for their excellent work quality, perfect execution and promptness. Clients can avail these services from us at leading price. 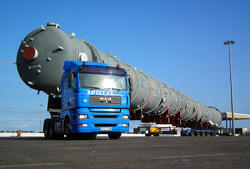 Looking for Project Cargo & Breakbulk Handling Services ?